Hey guys, it's me, Strong Vader. I've decided to give my idea a go with an SBCG4AP concept. This will be sort of a walkthrough of my idea for an SBDG4AP episode. Enjoy, and please leave feedback and suggestions. EDIT: Since the mods locked this thread on the other forum, I'll post it up here for us guys to enjoy. Those dimwits down at the public works won't know what hit them! More content will be included whenever I feel like it. We have seen Dangeresque 3: The Criminal Projective, and we would like to make it into a TV series. Please respond favorably. P.S. Mumble mumble mumble blah mumble mumble bubble de bubble double bubble. Strong Bad reads it, getting more excited and agitated as he reads the E-Mail. Not reading the P.S., he rolls around the floor, ecstatic and yelling for joy. You'll start in the Computer Room. A stolen Corpy NT6 is on the table, with the e-mail on it. Strong Bad's not-quite-BMW lighter is there. Pick it up. Go to Strong Sad's Room. Talk to him about the Dangeresque TV series. He'll tell you that you need a lawyer for copyright purposes, and that you'll need spinoff items. Asking him for help won't do anything, but burninating his sloshy poster should get you some Strong Sad abuse points. Go to the bathroom, and pick up the glue sitting on the sink. Hey, you know the best lawyer that soft tacos can buy! The Cheat! At this point, the KoT's castle will appear on your map (or more accurately, his grill). And that guy who sells dangerousesque crap for "kids" to play with: Bubs! His stand will also appear on your map. There's nothing to make The Cheat's payment in the kitchen downstairs, but there's the Horrible Painting in the fridge, for some weird reason. Extend the LuxaLounger for a spinoff toy idea. Go to SB's room to get the Black Metal Detector and Shovel Attachment. Go to the basement. Pick up the head of lettuce from the dryer. Head over to the King of Town's grill. The Cheat won't join you on your quest because you kicked him in the dryer earlier, and wants his pay in advance. Look under the cardboard box next the grill to get a Dangeresque 3 T-shirt (costume, not a spinoff idea). Head over to Bubs's Stand. Talk to him about the Dangeresque TV series. Bubs will jump in, but only if you give him four spinoff ideas. Hand him the idea notecard you have-a plastic Nunchuck Gun. Use the Detector around the Conces5ion Stand to find what's either dirt, or ground beef. Walk around the field. There's a cardboard box by The Stick, which has the idea notecard of Plastic Dangeresque Shades. The Brick Wall has a cardboard box in front of it. There's nothing in there, but when you burn it, there is, inexplicably, a manual page to Baddest of the Bands Tycoon, the Videlectrix videogame for this episode. Head on down to Strong Badia. Using the Detector will reveal soft taco shells. Looking at the Strong Badia Sign will give you, for some reason, a bottle of Tabasco sauce. There will be a cardboard box just outside of Strong Badia. It will contain "Assorted Vegetables". Head back home. Check the mailbox for another manual page. Go inside, and make four (or five, for awesomeness points) tacos in the kitchen (Taco shells->Counter; Ground Beef(? )->Taco shells; Lettuce->Ground Beef; Assorted Vegetables->Lettuce). These tacos will conveniently form a "Box of Four Tacos" in your inventory. In the final stage of one of them, use the Tabasco sauce on one of the (five) tacos. Give this one to Strong Sad for Strong Sad abuse points. Head over to the KoT's grill, and hand The Cheat his *ahem* payment. The Cheat will eat the tacos, and gladly throw water bombs at Homestar, who will conveniently start selling Dangeresque TV series merchandise...in front of Strong Bad. All this action makes the KoT hungry (then again, what doesn't?) and he will come on out and attempt to start the grill. Help him out, with that lighter of yours. You're about to light the fire under the grill, but see a spinoff item idea-Craig Plush Dolls. Lighting the grill isn't important anymore, as the KoT just ate the wood for the grill while you found the spinoff item idea. Give Bubs the spinoff item ideas, and he'll happily make a factory nearby to make the items. Fade to black. Fade in. Bubs is creating the toys at a breakneck pace, and better yet, they sell like and smell like hotcakes! Ask Bubs about free merchandise, and he'll give you a defective nunchuck gun. It doesn't fire the foam dart(s) that come with it, and the nunchucks are fused together. Head back home. Use the defective nunchuck gun on Strong Sad for awesomeness points; the gun may not work, but he's allergic to hotcakes. Go to the Computer Room. Try to unplug the Corpy. For some reason, The Cheat's head explodes. Trying to unplug it again will make Strong Sad's head a splode (more awesomeness points). Use the Corpy to respond to that e-mail from Cheap as Free Productions, and Strong Bad will send a message that he has a copyright lawyer and a source of crappy spinoff items. There is a cutscene, after which Strong Bad and the other cast members are in the Basement, awaiting the Dangeresque TV series. But, as certain clips show, it is TERRIBLE. Crack Stuntman plays Dangeresque. Renaldo has Fightgar's voice. Baron Darin Diamonocle wears glasses. There are a crap load more inaccuracies and terrible directing decisions. But the worst part (all right, the second worst part) is that the fine print that SB forgot to read earlier gave Cheap as Free full control over all of the characters from the Dangeresque series, and will retain control for fifteen years. The worst part is that everyone else loves the show! Can this menace be stopped? Here, the Dangeresque TV Show set will appear on your map. You can try going there and convincing A. Chimendez to let you take creative control over the TV show, but he won't let you. You can try talking to Crack Stuntman about acting like Dangeresque better, but he likes his way better. Oh well. If Strong Bad can't have creative control over his brainchild, then he's gonna have to do what he does best: sabotage. So what do the other characters see in this show? What's your crap, is other crap-for-brains' treasure. So let's see what Dangeresque Two sees in the show. Head over to Homestar's house. Ask him why he likes the TV show. He likes the voice of Fightgar as his voice and the fact that he beats up Baron Darin Diamonocle in every episode. Go over to the set. Bubs, who plays Diamonocle, is to the far left in the area. He's practicing his lines for the new commercial for Dangeresque (TM) toys. You can try giving him the Total Load, but Bubs will be very suspicious. Hey! If you can't trust a disgruntled Strong Bad with some illegal muscle enhancers, who CAN you trust? There are some bottles of water on the table next to Bubs. Spike one of them with Total Load. Bubs won't drink that particular one, but it'll work on the Informer (Strong Sad), who sings his "I really gotta pee" song from other plug really fast. Can I offer an idea? Strong Vader authorized it, so I's a post it! Go to the Dangeresque set and give the alarm to A. Chimendez. When he hears the alarm going off, Bubs will break into Total Load-induced hysterics and chase Chimendez off the set. During this battle, Bubs' glasses will break so that there's only one lense left. Now THAT'S Diamonocle! Go back to the set and talk to Crack Stuntman. It seems that he only agreed to work on the show because they support Pistols for Pandas. He will go into a several-minute rant about his cause, and while he's doing so, the Dangeresque glasses will fly off his face and shatter. Crap! We'll deal with that later. For now, tell Crack Stuntman that there's an innocent panda in need of firearms at your house. Go there after he leaves to see him trying to wake up Strong Sad. Talk to him about different ideas for waking him up and sue the "slap" option. It won't wake him up, but you'll get abuse points! Go to the photo booth and put on the glasses from your inventory. They will be magically repaired! Go back to the set and take the job. Now, about Dangeresque Too. The fans seem to love the CGI version of a muscly, tough Dangeresque Too voiced by television star Fightgar. If you enter A. Chimendez's office (now taken over by Bubs since Chimendez got chased off of the set), you'll see a TurboGrafix computer. That's the secret to the CGI stuff. If you try destroying it, Bub'll get mad, since he "paid ""good money""" for it. Looks more like he paid fifteen counterfeit dollars for it in a garage sale, but whatever. Tell Bubs that you have a better computer. When he asks what computer, reply with the Corpy NT6 option. When Bubs asks if you stole it, say "no". When he asks who stole it, choose the Homestar option. Around this time, Crack Stuntman will come back. He'll say that the panda woke up, but didn't do anything. Hand him the broken nunchuck gun. Choose the Pistols for Pandas option, then the devil option to sarcastically suggest whacking the panda over the head with it. Crack'll run out enthusiastically. Then, ask Bubs (who is now steaming red) if you can borrow his phone. He'll let you use the phone on his desk. Call Marzipan and tell her that Crack Stuntman's attacking a panda in front of your house, and that the Panda Soy Tofu Baby Seals Environmental Association called her to let her know. Then call Homestar and tell him that there's been a script change and that he gets to beat up Diamonicle...twice an episode if he joins up now. When Bubs leaves in a steaming rage to beat up Homestar, follow him with a camera in the room (Bubs won't let you use it earlier) and use it for footage in Dangeresque. 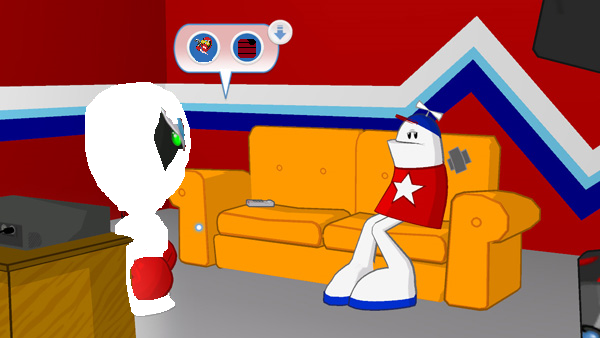 After you have the footage of Bubs beating up Homestar, go to the Computer Room and swipe the Corpy. Bring it to Bubs's office, and take the TurboGrafix computer, and replace it with the Corpy. Replace the Corpy logo with the TurboGrafix logo with the Light Pen. Once that's done, Fightgar is out of a job. Now, film an episode. You do that by selecting a character, then an action, then an object. For example: "Diamonocle--pull--lever." You can get out of the director's chair to look around the set and do things that you can't do while you're busy filming. ...or tar and feather you. What? It was THAT bad? Really? Wash the stuff off in your bathtub upstairs, then find out what everybody dislikes about it. Apparently, everyone misses the cool special effects explosions provided by the TurboGraphix computer (except Marzipan, who's whining about woman's rights and eco-friendly sets and whatever and who knows what.) Regrettably, you can't return the TG to its place without admitting that you stole it the first time. So, you'll actually have to (squeals of delight) make REAL explosions! Return to the set. See if you can find anything explosive. Well, you've seen Bubs explode into a fit of rage before...hey, that's not a bad idea! Start filming and use the command "Dangeresque Too--Kick--Diamonocle" until Bubs gets red-hot mad and leaps at Homestar. Homestar will step neatly out of the way, letting Bubs crash into the wall. Hmm. Still not quite...explosive enough. Hey, where are they even getting all this tar? The only local supplier of goods is Bubs, and he's busy working on the show. Right? Right? Talk to Bubs to find out that he has a barrel of tar at his Concession Stand. Go there and take some, you never know when it might come in handy. Let's just say that it was nowhere NEAR as disappointing as last time. When the dust clears, Strong Bad will realize that the highly flammable set is still (surprisingly) intact! You can make more episodes! You can-hey, why is Marzipan coming towards you with a pile of suspicious documents? Well, it turns out that all of that stuff Marzipan was talking about got you kicked off the air. Crap! You head back to the basement, waiting for the tar-and-feather embarrassment that will soon be yours. Hey, why's everybody so excited? It turns out that Dangeresque: The TV Show was a huge hit! They're calling it "The Show that was too cool for Daytime TV!" The Cheat even went so far as too call it (in his own squeaky way) "Too Much of an Awesome Thing." Wow! Well, we hope you enjoyed playing (or at least reading about) our SBCG4AP Episode. But all of the doors in this Executive Video-Game Making Headquarters Skyscraper are broken. So it looks like we're gonna have to jump! Looks like we're gonna have to jump! Now we need some behind-the-scenes Easter Eggs for the gameplay after the game is over. I think a good one would be making more Dange-TV-esque episodes after the episode is over. You know, I think that having Crack Stuntman holding the nunchuck gun with the Dangeresque shades would be better for the logo, don't you? Just what I think. I has made two screenshots. The first is the opening screen for Dangeresque: The TV show, as seen on TeeBee (it's quite large, you may have to click "View Image" to see it.) The second is a picture of a tarred-and-feathered Strong Bad talking to Homestar about a) why the TV show sucked or b) where the tar and feathers came from. I expect these to get a Fanstuff page, too! Not a bad idea. Send it to TBC? i've made a bunch of pages to the fanstuff page. I've added Screenshots and Menu Responses. Could i put in some of the wiki format stuff? Like galleries for the images? Whoops! Sorry! I forgot to log out of the pizza bot. You can delete that post, you know. What...and delete half of the Pizza bot's posts? For shame! WHAT DOES HE EVEN DO?!?!?! ?